Why Don’t I Always Have to Sign for Credit Card Purchases? Between deliveries, bank transactions, and contracts large and small, scribbling your John Hancock is practically an everyday event. But have you ever wondered why you sometimes don’t have to sign for a credit card purchase? The answer is a little more complex than you might expect. Before discussing when you need to sign for a credit card purchase and when you don’t, let’s review the reasons you sign for plastic transactions in the first place. The first is identity verification. One of the reasons you’re required to sign the back of your credit card is so that merchants can check the signature on your card to the signature on your receipt. If they don’t match, this is one way to catch a credit card thief. Of course, it’s pretty rare that a store clerk will actually take this step, but it could theoretically happen. The second is to protect all parties involved (you, the merchant, and the credit card company) in the event that a purchase is disputed. For example, if you spot a transaction your credit card statement that you didn’t make, the credit card company can demand a signed receipt from the merchant to prove you it was you who swiped the card. If he can’t, your case is bolstered. But alternatively, if he can, he’s protected from having to refund the cash. Signatures are all well and good, but in today’s world we have a need for speed. The two major credit card networks (Visa and MasterCard) recognize this, and have started to reduce the signature burden on retailers. 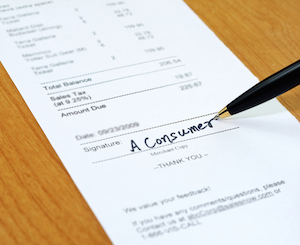 Consequently, whether or not you have to sign for a purchase mostly boils down to how much you’ve spent. As of October 2012, MasterCard doesn’t require signatures for most transactions under $50. Likewise, Visa no longer requires signatures for transactions under $50 at grocery stores and discount stores, or purchases under $25 at most other retailers. This explains why your morning stop at the local coffee shop doesn’t involve signing for your latte. But keep in mind that there are exceptions to these guidelines. Visa and MasterCard require signatures on purchases of any size from certain merchant categories, including quasi-cash, gambling, direct marketing, money transfer, automated fuel dispensers, and financial institutions. Also, just because Visa and MasterCard don’t require signatures on small transactions doesn’t mean that the merchant you’re shopping with is onboard with ditching autographs. Remember, signing for a purchase protects the retailer in the event that you dispute a purchase. Some merchants aren’t willing to take the risk of losing out on profits if they end up in a scuffle with your credit card company. Will signing go away with the transition to EMV? By now you’re probably wondering about the fate of signatures when the U.S. migrates to EMV credit cards in late 2015. The answer to this question is unclear. There’s the possibility we could all soon start punching in PINs when we use our cards, which would eliminate the need for a signature altogether. And chip-and-PIN technology has the advantage of being one of the most hack-proof payment systems out there today. But the reality is that we’ll probably shift to chip-and-signature, not chip-and-PIN – at least initially. It’s been a struggle to get U.S. consumers, retailers and credit card issuers to make the move to EMV, so going from simplistic magnetic strip payments directly to the more complicated chip-and-PIN might be too big a leap to make overnight. And with chip-and-signature transactions, the same autograph rules Visa and MasterCard set out for swipe-and-sign purchases remain in place (see above). Overall, holding onto signatures is less disruptive to our usual way of doing business. So keep practicing that signature – you’ll probably still need it for large credit card purchases for quite a while!